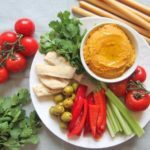 Introducing you all to a great healthy snack – roasted butternut squash hummus. This savoury sweet delight is bursting with flavours of paprika, cumin and lemon. And best still is that it goes with everything – crunchy vegetables, toasted pita chips, homemade sharwarmas and my favourite crisp apple slices. This is a variation of the basic hummus recipe I posted a while back. Adding roasted butternut squash gives the hummus a deeper and sweet flavour that complements the chickpeas and spices very well. 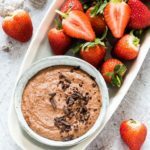 You end up with a lovely colourful creamy healthy dip that is sooooooooo morish. And it is very easy to make too. 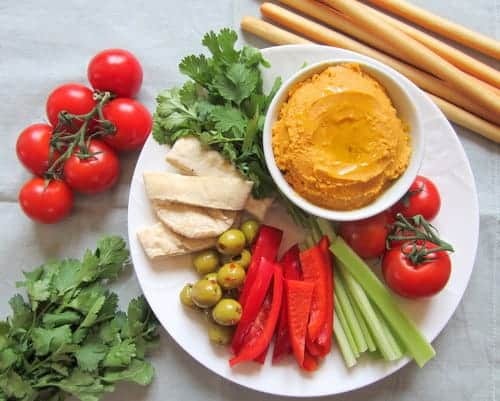 Hummus is one of my usual contributions to lunch or brunch parties – especially those last minute gatherings. 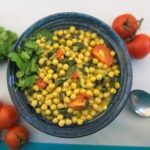 If like me your pantry is stocked up with endless chickpeas then here is one further way to use them up. Vary the spices to suit your tastes and your pantry staples. You could try substituting the butternut squash to make a sweet potato hummus. As I write this I am lying on the floor trying to see how many pitta chips I can fit in my mouth. I think I can fit three hummus covered pitta chips in one go. 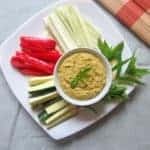 My recipes ideas book is open to the hummus page and I am dreaming up other combinations of vegetables I can add to hummus. I think I am a hummus addict. I think next I will try the red hummus…………………. This is the final recipe in the pantry staple spotlight on butternut squash. Please be sure to check the others out. Roasted butternut squash soup with coconut. How to peel and cook butternut squash. Don't forget to tag #recipesfromapantry on Instagram or Twitter if you try Roasted Butternut Squash Hummus! It is really, really awesome for me when you make one of my recipes and I'd love to see it. You can also share it on my Facebook page. Please pin this recipe to Pinterest too! Thank you for reading Recipes from a Pantry. Toss butternut squash cubes in a little olive oil and salt and roast for about 25 mins till done. Make sure you turn the butternut squash at least once so that the cubes brown evenly on all sides. 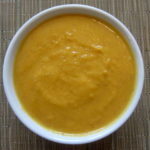 Allow to cool and transfer butternut squash into a food processor. Add all the other ingredients into the food processor. Whizz them into a paste. Check for seasoning and lemon juice and add a little more if necessary. Transfer into a bowl, sprinkle on some paprika. Serve with crunchy vegetables, pita chips or fruit slices and enjoy. To get the garlic flavour well mixed in for this variety of humus please add the cloves crushed into the food processor. Add more olive oil / water if you want a more liquid hummus. Adjust spices to suit your taste - start with less and increase them slowly. We grew butternut squash this year and I have close to a dozen of them. We like hummus and recently tried white bean hummus. I’ll give this a go. Thanks for the idea. Hey Dawn, happy to share the butternut squash love. Oooh, this is a must try for me! I love hummus but have never thought to add roasted butternut squash to it. Sounds so good! Hey Tammy, you are in for a treat. I’m not a big squash fan, but it sounds good! Maybe this is the recipe that can change your mind? I can imagine some homemade pita dipped in your wonderful looking butternut squash hummus. Gorgeous color shade Bintu! Now you have me wanting to go make some more. Yummm! I love the sound of this. I just made roasted red pepper hummus yesterday and still have some leftover chickpeas. I will try your recipe next!! Am I too much of a hummus addict as hearing that makes me want to go an make some too? Thanks for commenting on my blog. I really loved the hummus and will be making it many times more. I think the squash makes the flavour and texture even better than a basic hummus. Thanks Jane. And thank you again for featuring this. I love butternut squash and if I could I would add it to everything. Thanks Vicki. Hope you like it.